Quirky 18th century British wall map identifying the Biblical paradise of Ophir. While essentially the same as D'Anville's map, Postlethwayte's work is a full re-engraving in which all text has been translated to English, a new cartouche of a rococo ethic incorporated, and Postlethwayte's own fascinating Anglo-centric commentary added. D'Anville was a careful cartographer known for his scientific approach to mapmaking, and nowhere is this more evident than in this, his greatest and most innovative map of Africa. Following the trajectory set by Guillaume de L'Isle half a century earlier, D'Anville takes a number of significant steps forward in addressing the confusions inherent in mapping this vast though mostly, in the mid-17th century, unexplored continent. These include unreliable cartographic suppositions regarding the African interior dating practically to antiquity. Many of these, including such speculative ideas as the 'Mountains of Kong', have been diminished if not removed entirely from this map, leaving vast unexplored areas throughout. What was known of Africa, however, D'Anville incorporates here in an impressive compilation of the most up to date reports from Arab, colonial, missionary, and exploratory entradas into the interior of the continent. Thus well mapped parts of the continent are limited to the Mediterranean Coast, Morocco, the Senegambia, the Congo, South Africa, the Kingdom of Monomatapa, Abyssinia, and Egypt. Morocco, Egypt, and the southern Mediterranean Coast (Barbary) were well known to Europeans since antiquity and D'Anville's accurate mapping of these regions reflects continual contact. Further south the colonial enclaves along the Niger River (Senegal and Gambia), the Congo River, and South Africa reflect considerable detail associated with European penetration by traders and missionaries. The land of Monomopota around the Zambezi River was explored early in the 16th century by the Portuguese in hopes that the legendary gold mines supposedly found there would counterbalance the wealth flowing into Spain from the New Word. Unfortunately, these mines were mostly tapped out by the 15th century. More daring the D'Anville, Postethwayte adds additional commentary suggesting that this may well be the Biblical land of Ophir - from whence King Solomon obtained his wealth. Abyssinia (modern day Ethiopia), another possible Ophir, was mapped in detail by early Italian missionaries and of considerable interest to Europeans first, because it was (and is) predominantly Christian; second, because it was a powerful well-organized and unified kingdom; and third because the sources of the Blue Nile were to be found here. The remainder of the continent remained largely speculative though D'Anville rarely lets his imagination get the upper hand. He does however follow the well-established Ptolemaic model laid down in the Geographia regarding the sources of the White Nile – here seen as two lakes at the base of the semi-apocryphal Mountains of the Moon. However, he also presents a curious network of interconnected rivers extending westward from the confused course of the White Nile following the popular 18th century speculation, derived from Arab explorers of antiquity, that the Nile may be connected to the Niger. To his credit D'Anville mentions, but does formally advocate, this and offers no true commerce between the two river systems. Lake Nyassa or Lake Malawi, here identified as Maravi, appears in a long thin embryonic state that, though it had not yet been 'discovered,' is remarkably accurate to form. Lake Malawi was not officially discovered until Portuguese trader Candido Jose da Costa Cardoso stumbled upon it in 1849 – one hundred years following D'Anville's presentation of the lake here. D'Anville's inclusion of Lake Malawi is most likely a prescient interpretation of indigenous reports brought to Europe by 17th century Portuguese traders. Its form would be followed by subsequent cartographers well into the mid-19th century when the explorations of John Hanning Speke, David Livingstone, Richard Francis Burton and others would at last yield a semi-detailed study of Africa's interior. 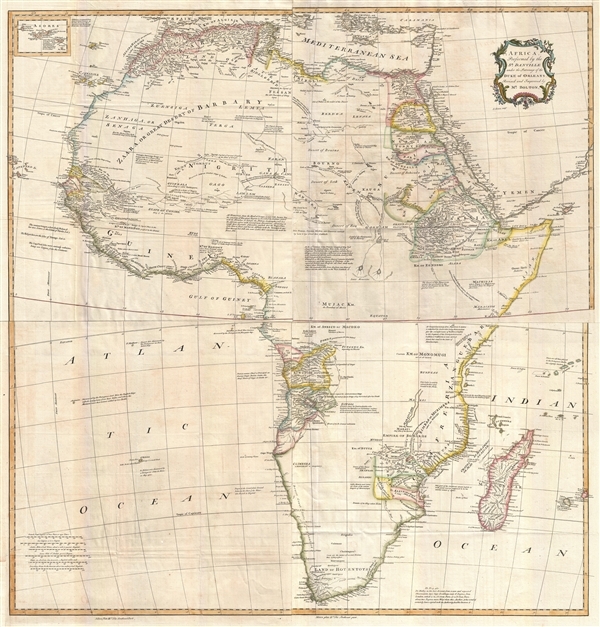 D'Anville published his version of this map in 1749 to update his earlier map of Africa issued in 1727. As a whole it is a complete reimaging of the continent with numerous updates and revisions throughout. Its accuracy and the influence of the D'Anville name made this the basis for most subsequent maps of the continent. Postethwayte's 1755 version utilizes Samuel Bolton to revise, translate, and had amendments to the map, however, it is little different from the D'Anville map. Bolton however, publishing as Boulton, did in fact make a vastly improved larger map of the continent in the late 1700s. This, like most J. B. B. D'Anville maps, was not compiled into a singular atlas, but was rather sold individually and compiled into atlas, case, or wall map format by the purchaser. The present example is on four panels joined as a single map. This map was drawn by S. Bolton, based on D'Anville, and engraved by R. W. Seale for publication in Postlethwayte's 1755 edition of the Dictionary of Commerce. Very good. Original fold lines visible. Blank on verso. Four sheets joined.